Dawn and Jimmy Creten will return to Mandan for Dacotah Speedway's Monster Truck Show scheduled for July 31st and August 1st. Jimmy will be at the helm of Bounty Hunter while Dawn will be wheeling her truck Scarlet Bandit, we are excited to have 2 of the top drivers and trucks in the world coming to put on a show for our fans! Since Jimmy Creten built the first Bounty Hunter Monster Truck back in 1996 it’s been a truck that brings out the best in every driver it pulls to the line against. The Bounty Hunter is a name that has become synonymous with success and top notch performance since it’s inception. Boasting big horsepower and some of the most talented drivers in the business the Bounty Hunter has been taking victories across North America for nearly two decades. 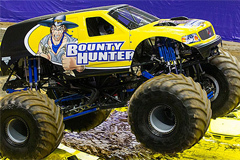 While the truck has sported many different looks over the years the same winning attitude remains as you can bet the Bounty Hunter is driven to win at all costs. With the popularity from one of the sports most popular names there are now two Bounty Hunter’s touring full time. Jimmy Creten’s current Bounty Hunter sports a Patrick Chassis built in 2010 and is one of the best performing Bounty Hunter’s to date. The other team Bounty Hunter currently piloted by Trent Montgomery was built in 2011 and features a CRD chassis. Both trucks are top notch pieces of equipment and drivers know when they compete against the Bounty Hunter, they’re competing against the very best! 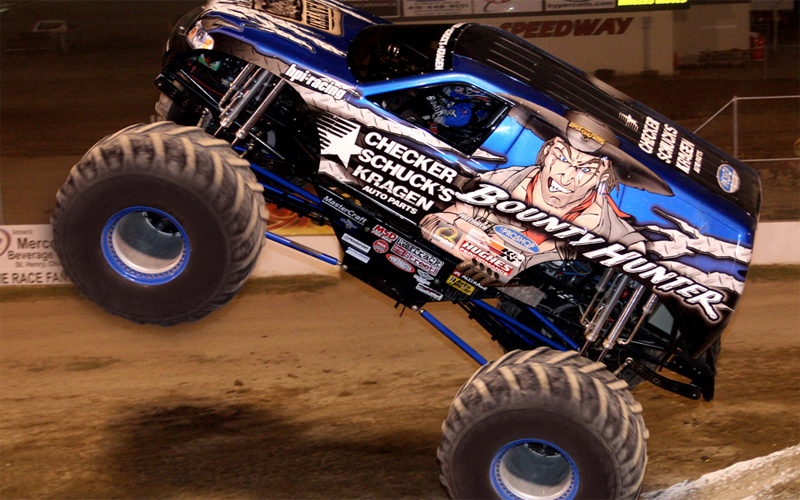 Jimmy Creten is one of the top drivers in monster trucks and a 2005 Freestyle World Champion. With extensive knowledge of robotics and a job as an engineer under his belt, Creten creates trucks with massive horsepower to help fuel his burning desire for a racing championship. Alongside his wife, Dawn (driver of Scarlet Bandit), Creten made 2Xtreme Racing a household name in monster trucks. The reputation for excellence that 2Xtreme Racing has gained in the sport is best evidenced by the team being named Team of the Year in 2006, 2007, and 2008. Creten’s team is the only team to have been awarded the prestigious honor for three consecutive years. Creten started out like many drivers with a modified truck that eventually led him to mud bogging, then on to the monster truck circuit, where he quickly made a name for himself as a top flight racer and technical freestyler, making moves like slap wheelies and combinations look easy. Creten is a staple at the Monster Jam World Finals, and his team has now grown to a multi-truck, year round operation t hat is one of the largest and most successful on the independent monster truck scene. FUN FACT: Creten was a competitive body builder during his college days! 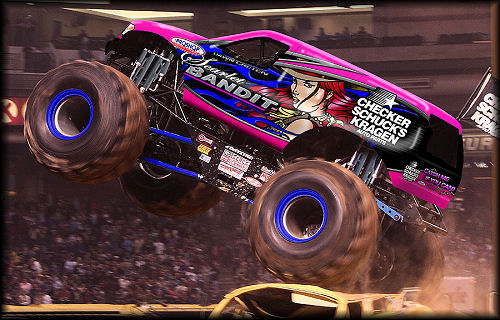 Since 1998 the Scarlet Bandit Monster Truck has been competing on the circuit and tacking victories along the way. Piloted by Dawn Creten, both the truck and driver have seen success over the years and gained a strong reputation in that time. Just because it’s driven by a lady, doesn’t mean it doesn’t pack a punch. The same 555 cubic inch motors that power the rest of the 2Xtreme Racing fleet are what Dawn unleashes every time she gets behind the wheel. The field knows better than to underestimate the Scarlet Bandit with a winning resume including major stadium events and Monster Jam World Finals invites. As a mother of four Dawn Creten has some of the regular mom duties you would expect, getting the kids ready for school, taking care of dinner, and flying a 10,000 pound monster truck. That last one may not be most mom’s but at the Creten household it’s what they know best. Creten has now been involved in monster trucks since 1997 after a chance meeting with her now husband Jimmy at the North Dakota State Fair following an event. Creten soon found herself immersed in the world of monster trucks and eventually into the drivers seat. With each even Creten grew more confident as her skills continued to improve. Fellow drivers and fans alike took notice as Creten’s following grew. With that following came success as Creten started to prove she was a strong competitor and started winning. In 2003 Dawn Creten claimed her first major stadium event racing victory in Vancouver, British Columbia and was pushing drivers like multi-time World Champion Tom Meents to the limit in a photo finish in Minneapolis. She followed up that success with another major stadium racing victory in Phoenix the following year. It was fluke as Creten repeated in 2005 by defeating husband Jimmy and the Bounty Hunter in Phoenix for the racing victory. That year Creten received her first ever Monster Jam World Finals invitation and put up a strong result with a sixth place freestyle against the sports top drivers. While Dawn Creten has had to take off time from driving the Scarlet Bandit for the births of he r children, it certainly never took away from her driving skill. 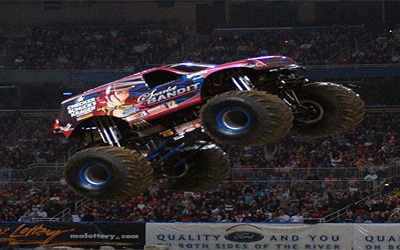 In 2007 she made her return to the Monster Jam World Finals after great performances in major stadium events. In 2008 Creten took to the freestyle course shortly after her husband was narrowly defeated for the World Finals racing championship, and delivered an incredible freestyle performance that had Sam Boyd Stadium going insane. Her freestyle that night would rank her second against the best in the industry. Creten continues to be one of the sports leading female drivers to this day and makes the guys sweat every time she hits the track. Note: Ticket info will be announced in the future. In the past there has been discounted tickets, if these are offered they will go fast, these along with regular tickets will fly off the counter, get them as soon as they become available. Keep checking back here or our Facebook page for ticket information.